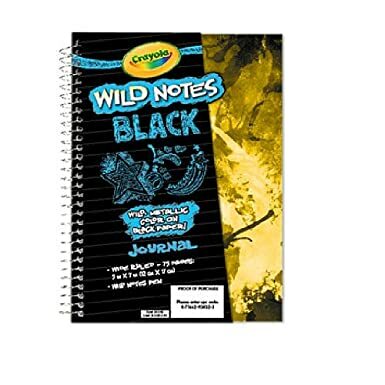 Take colorful notes of your daily adventures and all the latest hallway chatter! Sketch or doodle in multiple colors ? all with just one pen! Contains: 1 - Journal 5x7 inches, 75 College Ruled Sheets and 1 - Color-Changing Pen . My eldest daughter, our budding artist loves to try new things when it comes to art and this book, though not specifically geared toward doing art per se, allowed her to make some very cool contrasting drawings on the black with the color changing pen. She plans to definitely take this with her to third grade this year to take notes and I am sure to also doodle that the time is right (we don't want her getting in trouble). All-in-all I loved the contrasting colors and the size was perfect for easy carrying!